Utterly captivating, this piece by Leo Diamond is crafted in sleek 18ct white gold and set with a solitaire diamond resting delicately atop twisted split diamond set shoulders, totalling 2/3ct. With its unique facet design, the Leo Diamond is the first diamond to be independently measured for its fire and brilliance. Certificated by IGI & Gemex. 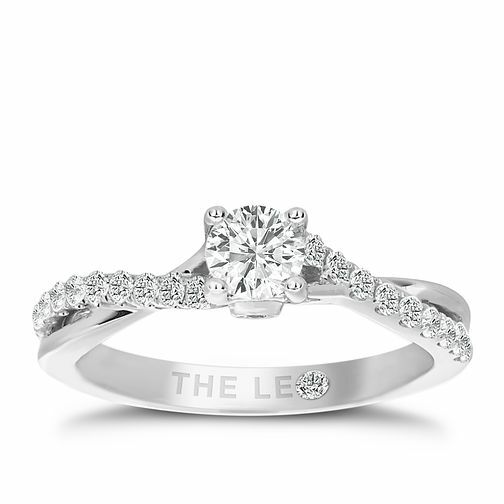 Leo Diamond 18ct white gold 2/3ct diamond ring is rated 5.0 out of 5 by 1. Rated 5 out of 5 by Anonymous from Stunning The most amazing ring ever. So bright and catches the light so much. Love it!